Our Romance packages packages contain our Silk Rose Petals plus scented and unscented candles. It's everything you need to surprise that special someone. 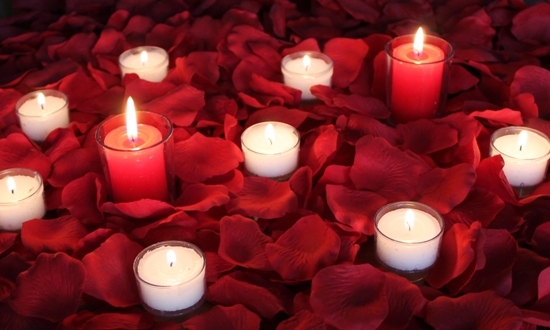 Romance 3000 contains 3,000 Red silk rose petals, 6 rose scented tealight candles (slightly smaller than above photo, but our new soy version), and 15 unscented candles. Sprinkle petals on a bed and scatter around a candlelit room. Spell it with Petals Minimum 20 petals per letter, ideally use 50-100 petals per letter.